Indians Wells CA - On an extremely hot Monday afternoon in the desert, Vasek Pospisil was finally cooled off. In temperatures that reached as high as 37 degrees Celsius, Pospisil was knocked out of the singles draw at the BNP Paribas Open at Indian Wells at the hands of Serbian qualifier Dusan Lajovic 6-7 6-3, 7-5 in a match which lasted just under two and a half hours. Pospisil, a qualifier into the main draw himself, ran out of steam in the 3rd set. After splitting the first two sets, the Canadian managed to break his opponent to go up 5-3 in the third and had a chance to serve out the match. However, Pospisil played a lacklustre service game in which he was broken at Love. The 26-year-old also had a match point in the following game but Lajovic hit a forehand past him at the net. In the next service game the struggles continued for Pospisil. He played some tired points from the baseline and was broken again. Lajovic proceeded to close out the match with relative ease on his service game reaching the fourth round for the first time in a Masters 1000 event. Pospisil finished with 30 winners overall but also 40 unforced errors, 23 coming off his forehand. He continued to play aggressively for most of the match just like he did in his win over Andy Murray but he won just 25 of the 43 points he played at the net. His serve wasn’t nearly as strong as it was in his win over Murray on Saturday. His first serve percentage was just 52% in the match, he had five double faults and he won less than half of his second serve points. Despite the loss, Pospisil was pleased with how he performed here. He won four straight matches including the biggest win of his career on the main stadium court over the World No.1 player which should give him a huge confidence boost heading into the rest of the season. The work he has put in with new coach Mark Woodforde is beginning to pay off. The Stadium 4 court wasn’t kind to Pospisil on Monday. Along with American partner Steve Johnson he also lost in the second round of doubles. It was the same court he lost his singles match on earlier. 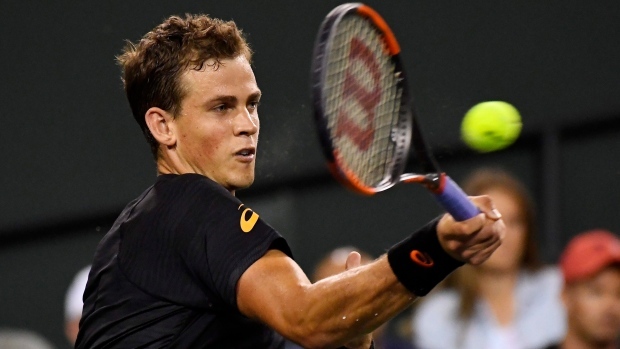 Pospisil has chosen not to try to qualify for the next Masters 1000 series event which starts next week in Miami. He will head to Mexico to play a pair of Challenge events instead.